A great View Point for fireworks on New Year's Eve in Kampala. On the tallest of the seven hills that make up Uganda's Capital City sits Hotel Diplomate Kampala in all its glory and splendor with a magnificent view and ambiance accorded to one of Uganda's oldest hotels by its location. 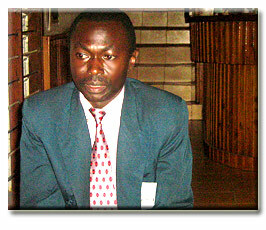 Godwin Wangwa"Our slogan 'Hotel Above The Rest' actually doesn't refer to the standards as much as it does to the location. The location of this hotel puts it above all the other hills and thus the hotels located on those hills," Godwin Wangwa, the Hotel Manager clarifies. Located 3.5 km from Kampala city center at the top of Muyenga tank hill, you can only hear the noise of the birds in the green vegetation that surrounds the Hotel, leaving the noise and dust pollution that is synonymous with Kampala city behind. A cool clean breeze constantly sweeps over this quiet part of the city, leaving you wondering whether you are in the hot and dusty greater Kampala or in the middle of the virgin forest area. "Our seller is the view and the ambiance the location of the hotel offers our guests," explains the Hotel Managing Director, Angella Katatumba. Because the hotel sits on the topmost hill in Kampala overlooking the city, you cannot miss to view at least six other hills of Kampala and part of lake Victoria-second biggest pure water body in the world. "This romantic view when caught at the right time with the right company and under the right circumstances will remain memorable for decades," says Barbara Namubiru, the Hotel Front Desk Manager. 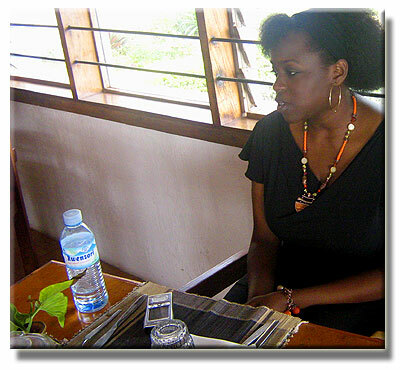 Angella Katatumba with Barbara Namubiru. Engraved in stone, half bricks and clay tiles, Hotel Diplomate has conquered Muyenga Hill for 20 years having been initially planned to be the residence of Mr. Bonny Katatumba, the owner and current Pakistan Consul in Uganda. "It was the biggest home in Kampla. Then my dad decided to start renting out rooms to make some money from it," says the Hotel Managing Director, who is a daughter to Mr. Bonny Katatumba. "When my father finally decided to make it a hotel, he run it himself till 1997 when he started leasing it out to foreigners-first to Kenyans for about two years then Indians for some years but non of them cared that much about it. So, he returned it back to his management," explains Angella Katatumba, who has spiced up the hotel management ever since she returned from Chicago where she had been to pursue her studies. "While in Chicago, I worked in the hospitality industry-working in different restaurants there. Mr. Katatumba was impressed by my skills and he let me take over as the Managing director in November 2004," she narrates the hotel's background as she sips some water in the hotel restaurant. Hotel Diplomate is not like the 10 or so storied hotels in the middle of the city, but an artistic structure with the main hotel area housed on two floors. 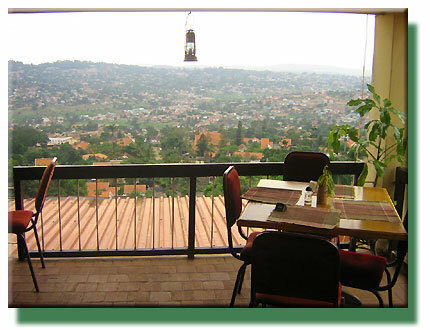 The ground floor houses the reception area decorated with yellowish and gold-like timber, a conference hall on the right with a terrace that lets you view the eastern part of Kampala. 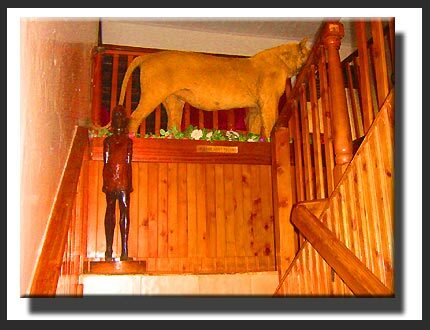 A wooden staircase of about five meters ushers you into the lounge on the first floor, where guests can watch television. 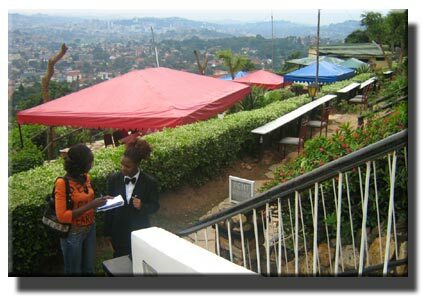 Next is a specious bar/restaurant and the terrace in case one wants to get a view of the other hill that make Kampala what it is today. While here or in the hotel room, you do not have to wait longer to get your bite since the kitchen is not more than 10 meters away from the restaurant and the hotel rooms. The Diplomate View PointOutside the main hotel area gives you yet another reason to plan another date to visit the hotel, probably with another person. An exit at the rear end of the lounge takes you to a higher level of the hill outside the main hotel, giving a better view of not just the Kampala hills and the main hotel's artistic tile roof but also a preview of Lake Victoria. 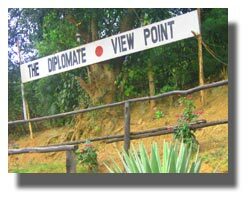 This place is called the Diplomate View Point. According to Namubiru, who took us on a guided tour of the hotel, to get a tent at the view point on the Eve of New Years Day requires early booking because this is the only area in Kampala where you can view firework displays in the entire capital as you sip a cold or warm drink. 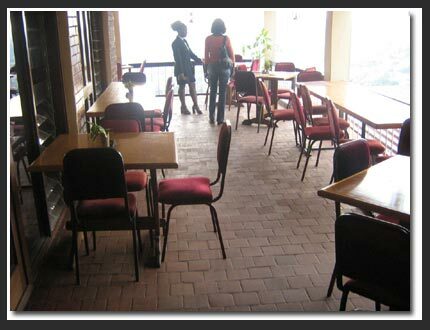 "Our clientele comprises 80% foreigners and the other 20% is mainly local diplomats and politicians. Why this Clientele? The Managing Director says that in addition to the accessibility problem, the standards of the hotel have been scaring off many Ugandans. "When the hotel started, it set high standards that most locals still associate it with high costs thus shun it," she explains. "Also, because it is located where getting public means is a hustle, the ordinary Ugandans, especially those without private transport means, have shied away from the hotel". For the guests who come to reside at the hotel, they have a choice of the Single, Double rooms, Cottages and the Penthouses (a unique facility the hotel provides). For the resident clients, the hotel provides room service, housekeeping services like laundry and car cleaning. The initial charge when one is booking in also caters for their breakfast. The hotel specializes in an English menu but also prepares continental dishes when a guest makes an order in advance. "For lunch and dinner, guests go to the restaurant or order for room service but pay for them separately," Namubiru explains, adding that apart from guests in the Cottages and Penthouses, private cooking or outside meals are prohibited in the hotel. Guests in the Cottages and Penthouses have the liberty to prepare their own food but can also order from the hotel. View Point right below the penthouses and cottages. Slightly above the Diplomate View Point are 4 cottages and above them 4 Penthouses/suites, which give you even a better view of the city and the lake as you share the beauty of wild life while in Kampala. These Cottages and Penthouses give you the kind of privacy that leaves you thinking you are in your newly acquired home. But what makes the difference is the romantic atmosphere that can make a honeymoon planned for a month to go for two. While in the Cottages and Penthouses, you are at liberty to prepare your own meal, a service that you may not find in most hotels in Uganda. "People even stay here for months," says Namubiru. "The Cottages and Penthouses are like homes in themselves with living rooms and kitchens," she says, adding that most of the people who rent the Penthouses are the foreigners who turn the Penthouses and Cottages into their homes. There are also local diplomats who also love coming here when they take their leave every year to relax while others come here when they have work that requires maximum concentration. Angella takes Eunice to Honeymoon Suite. 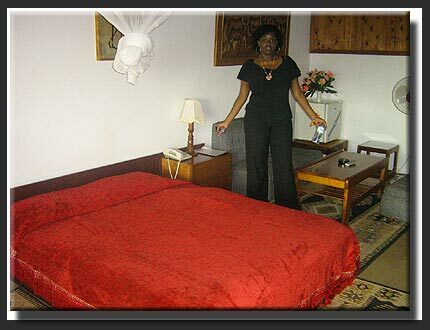 Barbara Namubiru in Honeymoon Suite. In addition to hosting wedding receptions and bridal dinners, the hotel provides exotic accommodation for the newly wed couples. Hotel Diplomate has two Honeymoon suites one in the main hotel and another among the Cottages. These suites have bigger bathrooms with potted plants, more furniture, a mini bar and bigger balconies. "We expect that a newly wed couple will probably have a number of guests coming to congratulate them. So we provide more furniture," explains the Hotel Managing Director. The Honeymoon Suites are specially prepared. "We for instance run them a bath with shower gel and sprinkle it with Rose Petals, put scented flowers all over the rooms and other romantic decorations and always congratulate the bride with a big bouquet on arrival," she explains. And, a top secret about these suites: you have to book these suites about three months in advance because of the high demand. Eunice with Barbara in single room. These are self-contained rooms with DSTV services as well as sofas; a reading table and a television set and are slightly smaller than the Honeymoon suites. Each of the Double rooms has a balcony with furniture on which one can catch the sunrise in the morning, sun set in the evening or meet their guests. Hotel Diplomate also caters for non-residents. The restaurant, Diplomate View Point, the Terraces and bars are open to guests, both resident and non residents, who prefer to while the hours away in a calm clean ambiance with the best view of the city and the lake. For those who want a hotel that is conducive for business lunches and dinners as well as conference facilities, this is the right place," says Wangwa, the Hotel Manager. 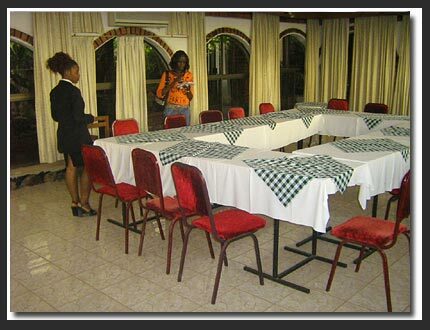 Apart from providing eats, drinks and rooms, the hotel also has two conference halls (Elgon and Rwenzori) suitable for conferences and seminars. And even if you just want to chill out, Hotel Diplomate answers your needs. "Families come to chill and watch the city over the weekends. They can also enjoy the barbeque dinner the hotel organizes every Saturday," says Wangwa, adding that people usually book tents for New Year's Eve at the Diplomate View to see the fireworks displays. Hotel Diplomate is one of the few hotels in Uganda with high standard amidst an industry filled with mediocre hotels and restaurants, something the hotel management find a big challenge to Uganda's hospitality industry. 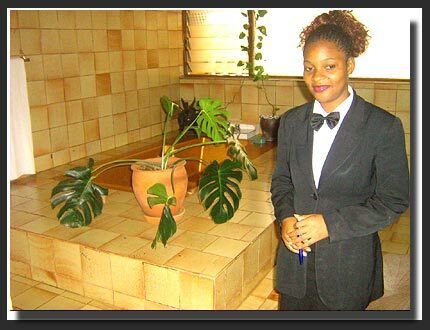 "It is difficult to come along trained staff or administrators to meet the standards of the hotel. Instead everyone wants to be a boss without working his or her way to the top," says Angella Katatumba, adding that the hospitality industry in Uganda is just growing. "The whole industry is still just a gamble. Therefore everyone from the administration to the staff and clientele is gambling. When people come to ask for jobs, they are so desperate. They present false documents which cannot be followed up since their referees lie for them. As a result these new employees do not live up to their expectations when hired." She however says things have improved. 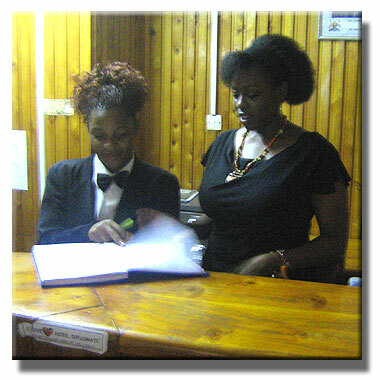 "The staff at the hotel is trained to treat the guest as a boss. I take off time to train my staff, hold meetings with them often to address the inadequacies in their services and they have improved," she explains. 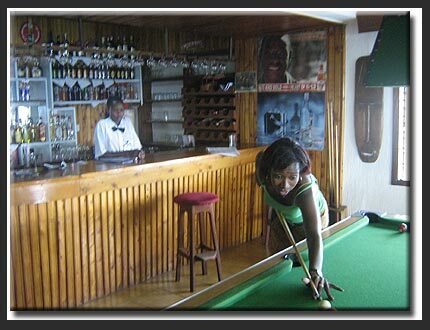 Angella Katatumba says that the hotel does not have competition from other hotels.�"Most of our clients are particular. All they want is a view, ambiance and privacy in which case they will come here, or a busier place and in that case they will not come here. Period," says Katatumba. "That is why we are not even bothered about the forthcoming CHOGM (Common Wealth Head of Government Meeting)." As the hotel moves towards renovation and putting additional apartments for rent, you have a reason to feel like you are up in an aeroplane when you are actually at Hotel Diplomate Kampala. And like the Hotel Manager says, for anyone seeking to hide away from the hustle and bustle of Kampala city, Hotel Diplomate provides the best option. Hotel Diplomate: Tel 0414 267625, Tank Hill Muyenga, email: diplomatekampala@hotmail.com.